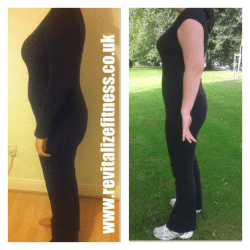 If you have a busy schedule and limited time to exercise, these Home Workout Programmes by Revitalize allow you to exercise where and when you choose and all just from £9.97 for the programme – Now that is amazing!! Be honest, how many times has the thought of getting ready and getting out of the house to exercise put you off completely? I have devised a range of workout programmes that you can complete in the comfort of your own home, without the need for any travel, equipment or clothing! The programmes are short, no longer than 40 minutes in total, but effective so they are easy to fit in to your routine. You chose when and where you exercise. No more early morning bootcamp sessions in the cold or missing the exercise class you struggled to get booked onto because the babysitter is late! Laura has been using the programmes for a month.